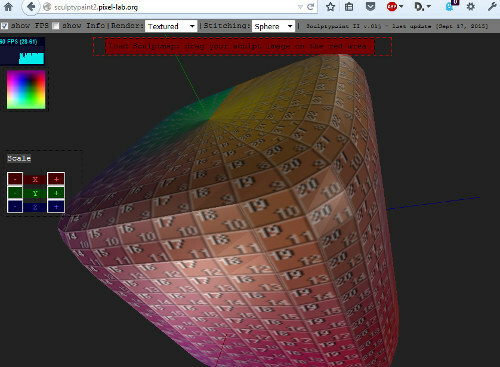 Sculptypaint 2, is a browser remake of an old 3D model creation tool I wrote, Sculptypaint. Currently I just is a sculptmap-viewer (normal and oblong maps), and I hope to add more tools, functions, etc. in the near future. It runs only in a WebGL enabled browser at the moment, currently firefox works best/fastest on my current system, chrome next. To keep this project growing, you can donate to Cel Edman in SL / Inworldz. Or check the About/Donations page, for my paypal, video-tutorial & more. About Sculptypaint 2 / support / donations / Legal stuff / Tips / etc. Page / 3D / webGL not working? Check this page for more information/tips etc. adding new tools and options.